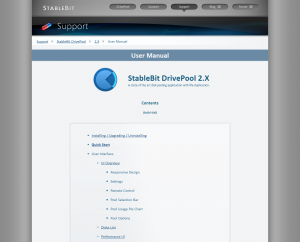 StableBit DrivePool 2.1.0.553 Release Candidate is now available for download. Now that we’re approaching the 2.1 release final and file placement is implemented, I’d like to start talking about “the next big thing” for StableBit. But before I get into that, let’s check out what’s new in this RC. Since my last post about version 2.1.0.528 BETA there have been a few new features added and a bunch of general fixes, not really related to any single area. I’ll just highlight the noteworthy changes here. You can now send a test email message after entering your email address for notifications. Minimize / maximize buttons were added to the horizontal UI. Stretch the window wide to see them. 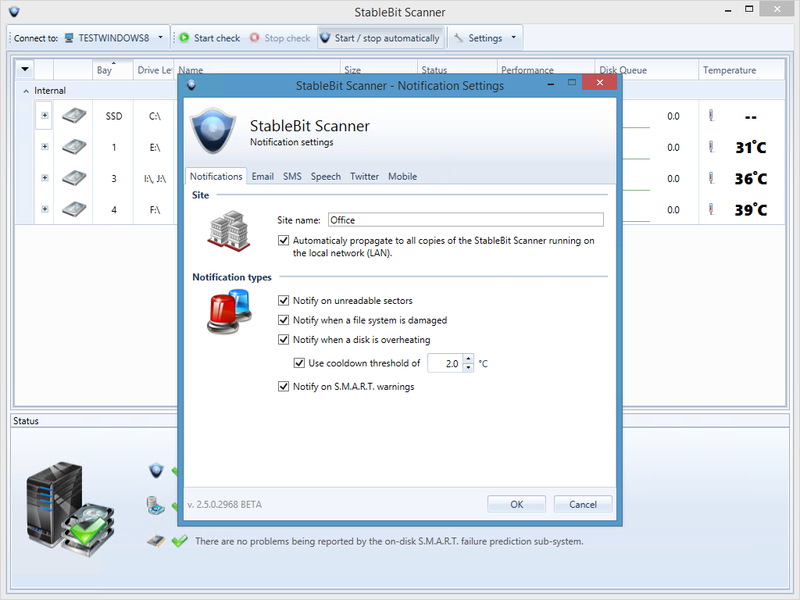 Fixed “Access denied” when removing drives related to the “System Volume Information” folder. The performance UI was not updating even though it was still open. 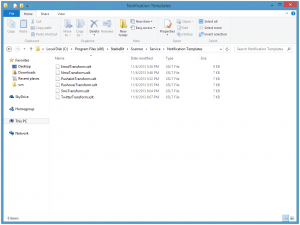 Renaming in a reparse point folder was not working. Don’t show the “.covefs” folder in the UI. 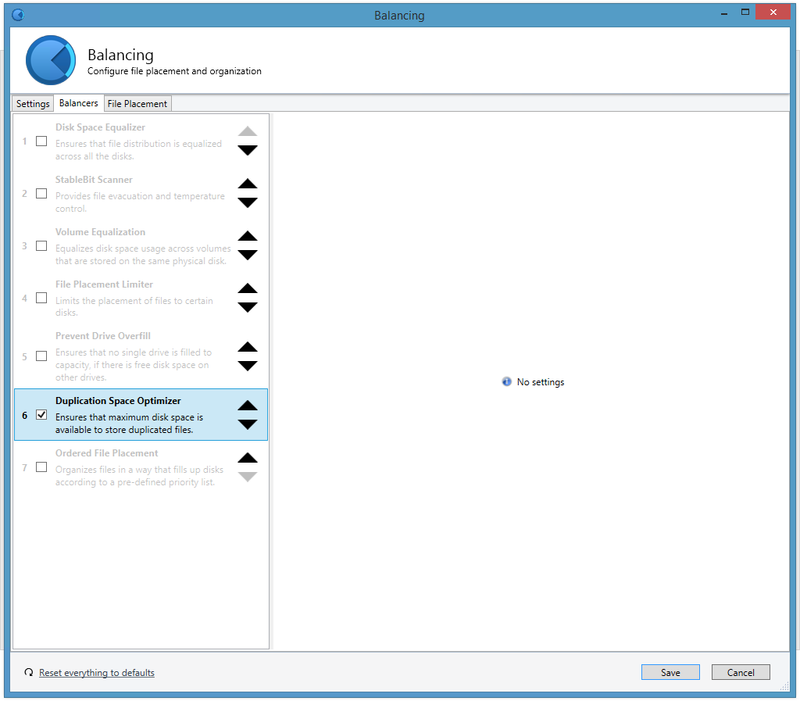 Fixed a real-time file size tracking issue having to do with file overwriting. WPF animations are now capped to 30 FPS on WSS for better performance. Let’s talk a bit about the future, the future of StableBit, and “the next big thing”. 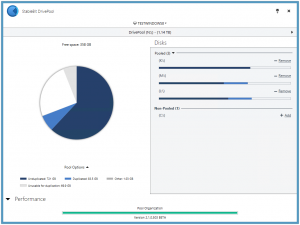 As a general concept, file placement is the ability to tell StableBit DrivePool which disks are allowed to store files placed in particular folders on the pool. I’ve been planning this concept for some time now. I’ve posted the first Nuts & Bolts discussion on file placement way back in September of 2013. But in that post I’ve only talked about specifically controlling which files go onto which disks. 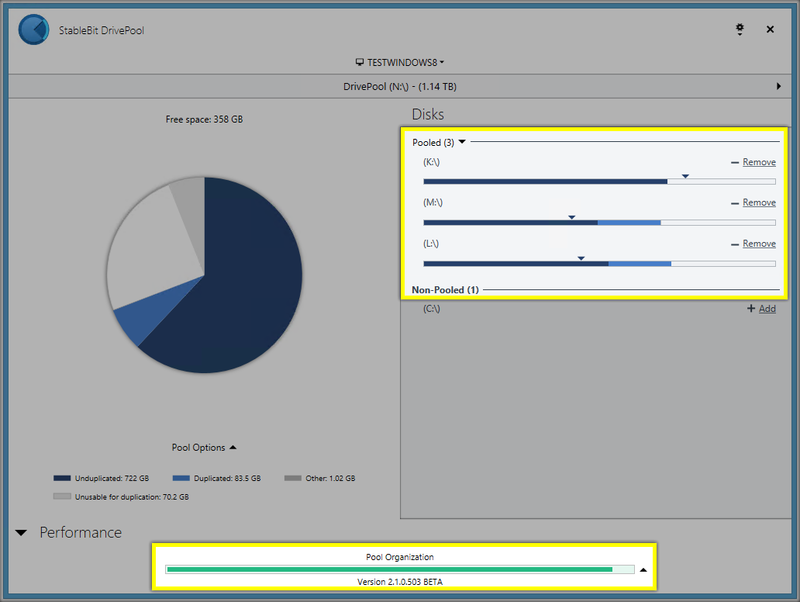 Well… there’s actually a lot more to file placement that will extend the value of StableBit DrivePool tremendously. 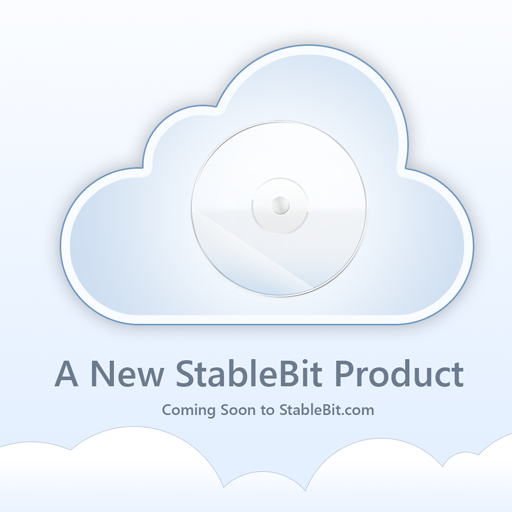 I’ve talked about Product 3 in the past, which is the code name for the next StableBit product. It’s currently in development and actually gives StableBit DrivePool’s file placement feature a much more prominent role. In order to understand why, let’s talk about how things work right now. 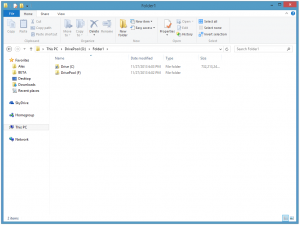 Right now, when you add a disk to the pool, a hidden “PoolPart” folder is created on that disk. Any pooled files that need to be stored on that disk are simply stored in that hidden Pool Part folder. 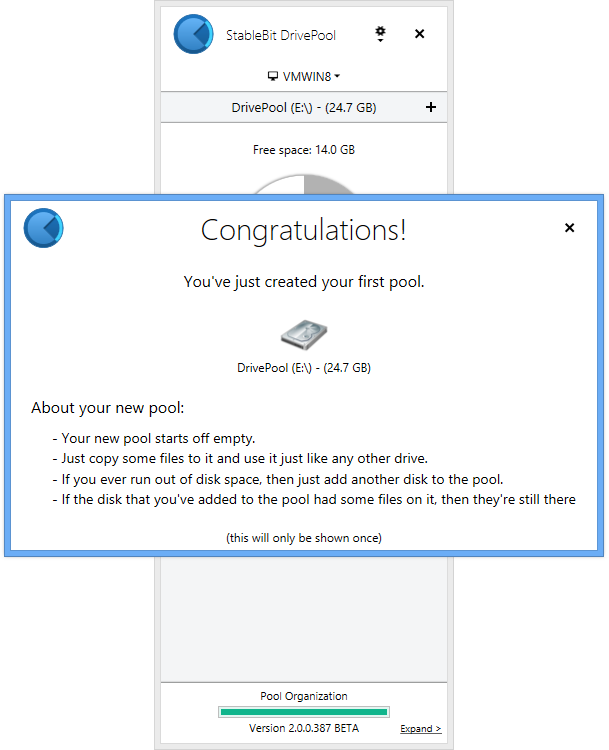 So in reality, when you add a disk to the pool, you’re actually adding a Pool Part to the pool, and that Pool Part happens to be stored on a local disk. I hope that you see where I’m going with this. 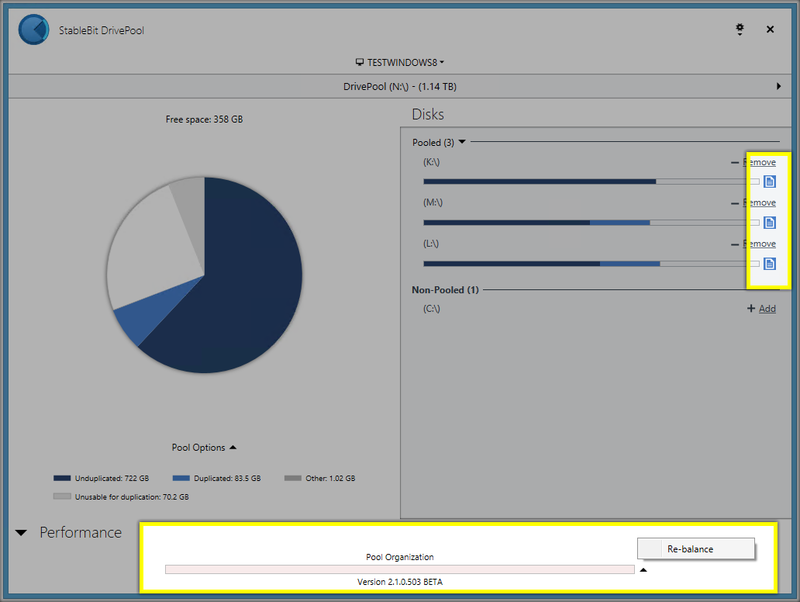 Product 3 will allow you to add Pool Parts to the pool that are not necessarily stored on physical disks. This is going to open up a whole range of very exciting possibilities. It’ll be possible to store Pool Parts on virtually anything that you can imagine that can store persistent data. Email servers, FTP, UNC shares, cloud storage might be some examples, all you’ll need is a plugin for which there will be an open API. 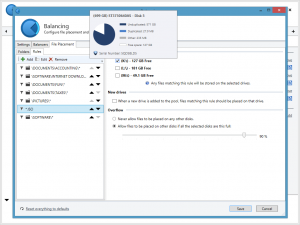 In this context, StableBit DrivePool’s file placement will gain a whole new use. 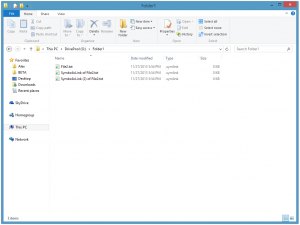 It will allow you to define which folders on the pool are stored on which mediums. 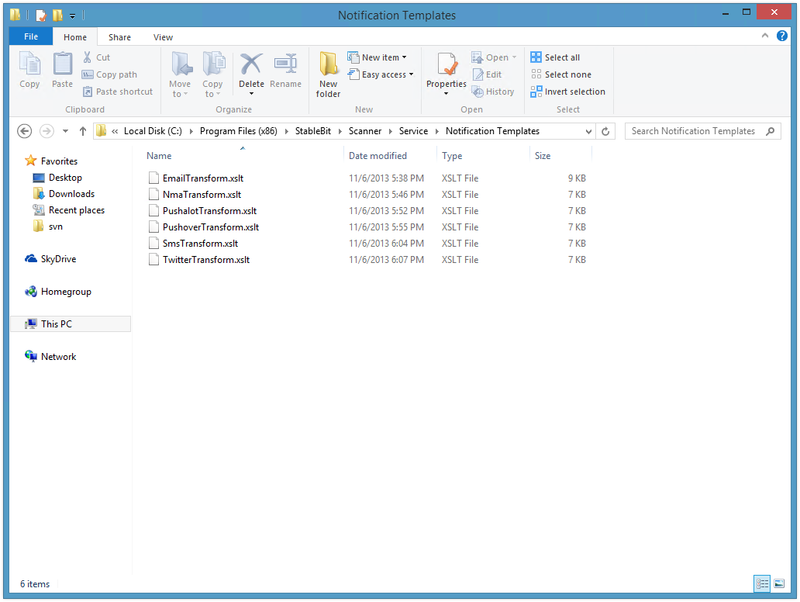 Moreover, with per-folder duplication, you will be able to specify which specific mediums will store the duplicated file parts, of each folder. I’ve just talked about how Product 3 can be used together with StableBit DrivePool, but really it’s much more than that. It’s going to be a full standalone product with some unique functionality. I’ll be talking about it some more as we get closer to the first public BETA. Both of these have been in BETA for some time now. I’ll be working on getting these out into release final form soon. StableBit DrivePool 1.3.6 is a bug fix release and StableBit Scanner 2.5 has some noteworthy new features. Until next time, and thank you everyone for supporting us. StableBit DrivePool 2.1.0.528 is now out. It features some updates to file placement and a bunch of bug fixes. 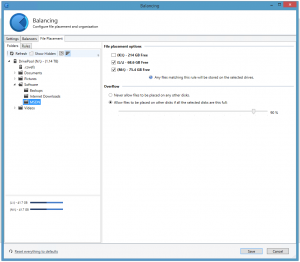 After the release of build 503, which introduced the new file placement balancing rules, we’ve had some fruitful discussions over on the forums about how file placement can be improved and this build incorporates some of those requested features. It also features some important bug fixes to file placement. There are a few UI changes as well as functional changes that have to do with how folder placement rules are applied. As you can see, there are now new icons next to folders that have folder placement rules applied to them. This makes it easy to tell which folders have rules defined on them and which are inheriting rules. 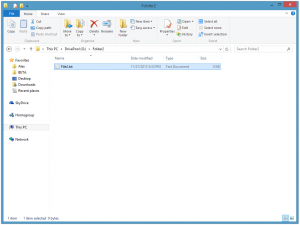 The icon is green for a folder that has a folder placement rule defined on it and it’s black if the folder is inheriting a folder placement rule from one of its ancestor folders. 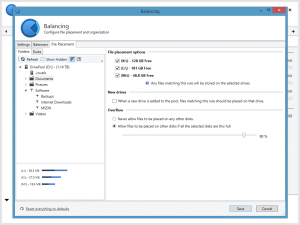 This brings us into a functional change that affects how all file placement rules behave in this build compared to build 503. 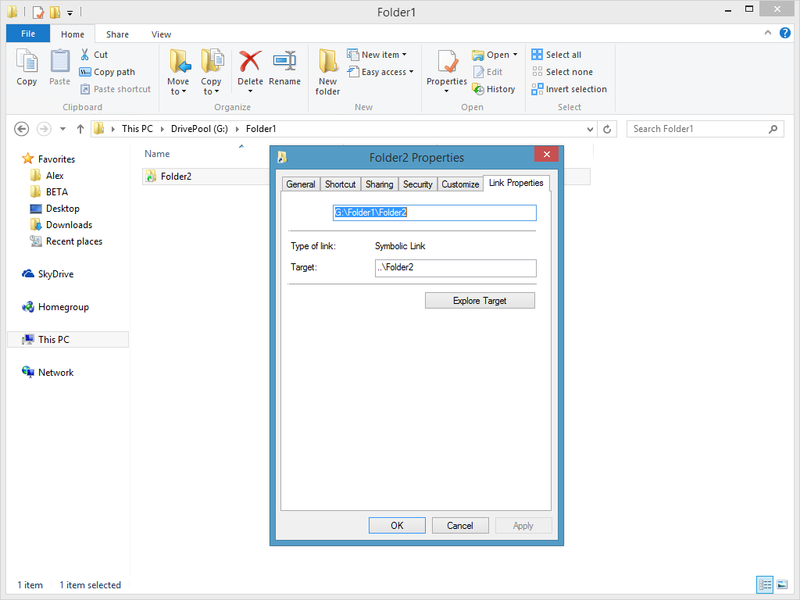 In build 503, if you defined a folder placement rule on some folder and then defined a different rule on a subfolder of that folder, the rule for the subfolder would get combined with the rule on the parent folder. This is counterintuitive and is really not obvious, so the latest build doesn’t do that anymore. From now on, multiple rules are never combined. 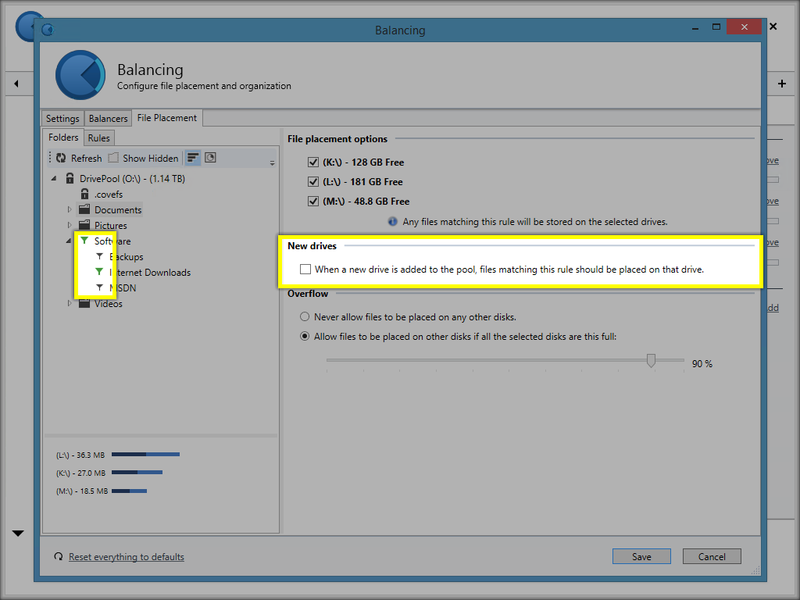 There is now a new checkbox that lets you control what happens to each file placement rule when you add new drives. In build 503, adding a new drive would add that drive as a selected destination for each file placement rule that you’ve defined. In the latest build it’s the exact opposite. 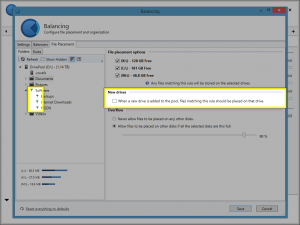 New drives are never added to your existing file placement rules by default, but you can bring back the old functionality on a rule by rule basis using this new checkbox. 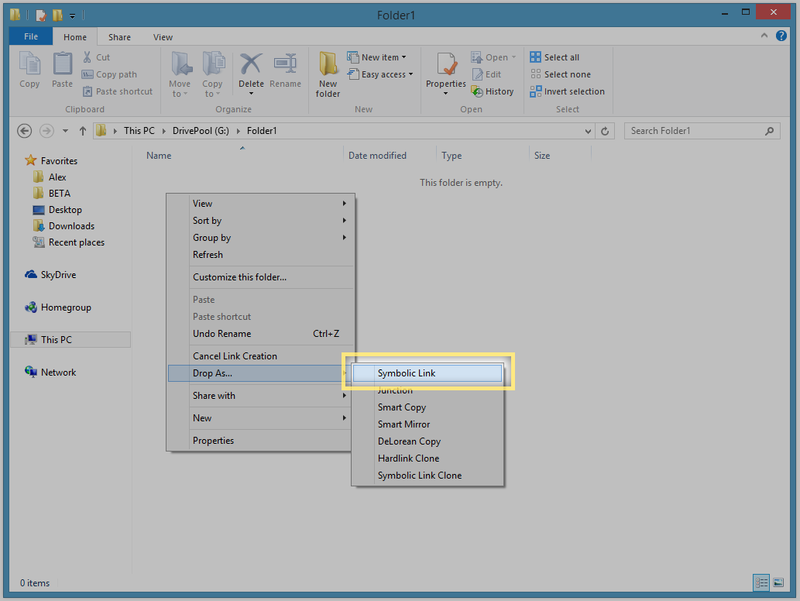 There are some functional and UI changes to the pattern based file placement rule interface. A very important functional change in this build is that only one file placement rule is ever chosen for each file, when selecting a destination for that file. If multiple patterns match a given path, then the highest priority pattern is chosen. This introduces the concept of rule priorities. In the UI, you can now rearrange your file placement rules by clicking the up / down arrows or with drag and drop. 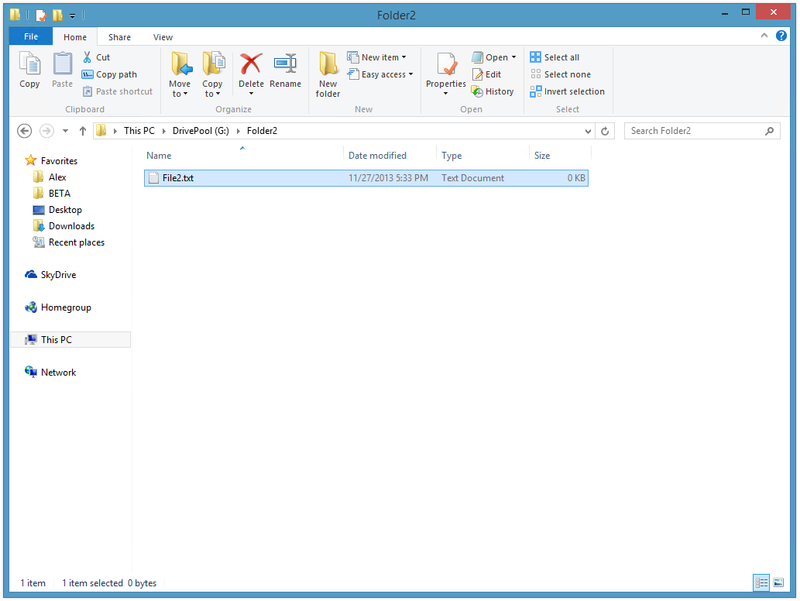 When arranging your file placement rules, one thing to keep in mind is that priorities are automatically managed for folder based rules (defined under the Folders tab). For folder based rules, rules defined on deeper directory structures must always have a higher priority than any rules defined on shallower directory structures. This is so that the user doesn’t have to think about priorities when defining folder based rules, and their rules work as expected. So you are allowed to rearrange your rules, given that you don’t violate that restriction. Pattern based rules can be arranged in any order and don’t have the same restriction. 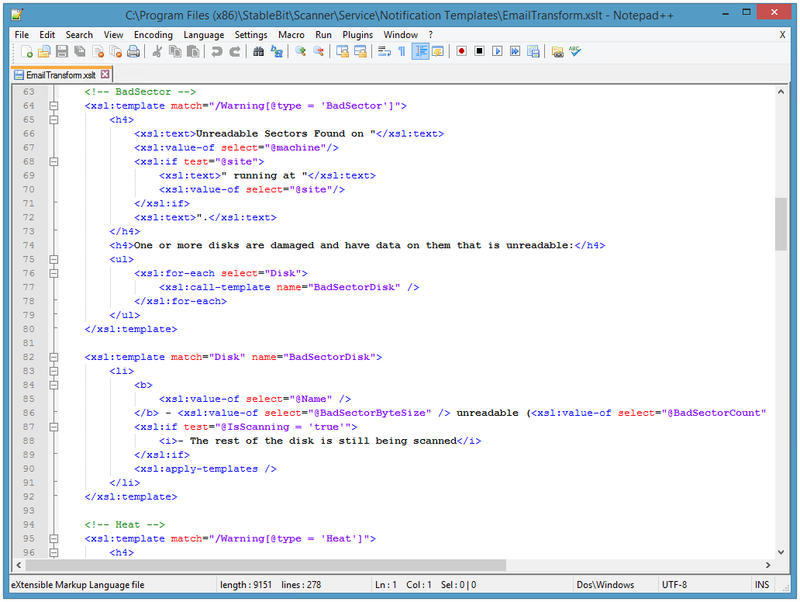 If you had any file placement rules defined in build 503, they will be automatically rearranged for you. Just to make setting up and managing many rules easier, you can now select multiple rules (using the standard hold SHIFT, CTRL paradigm) and make changes over all of them at the same time. 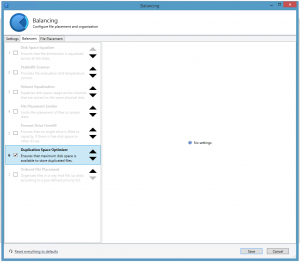 Tasks such as balancing and background duplication can now be manually aborted or boosted in priority from the pool organization bar. 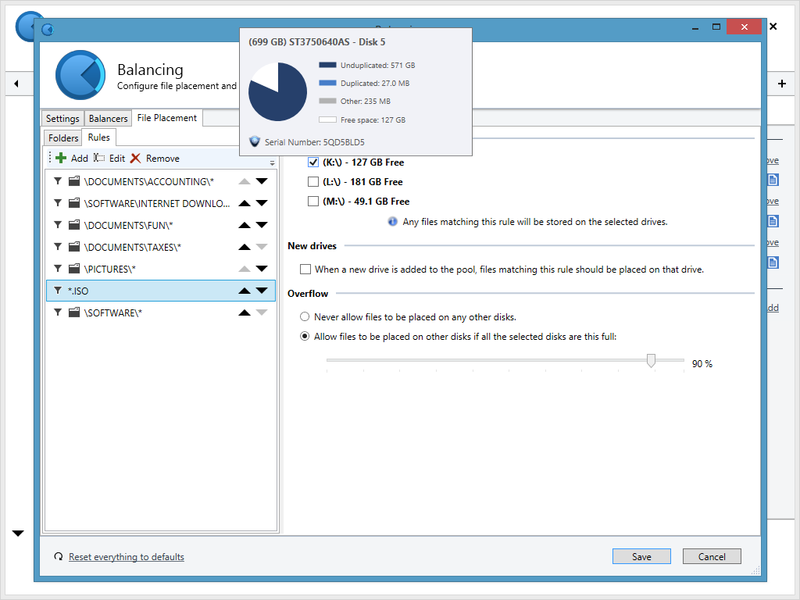 The progress percent on rebalancing and drive removal will now move continuously, even when moving large files. 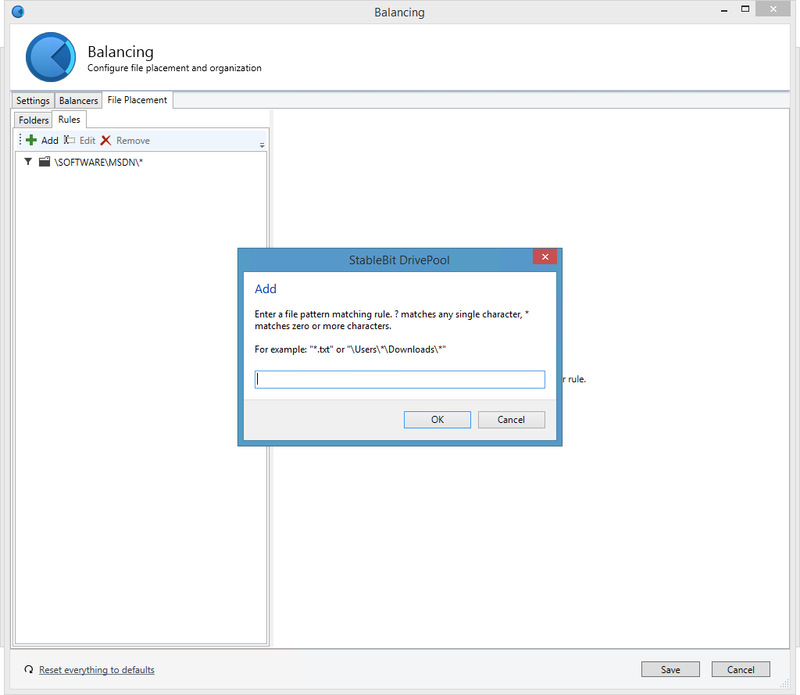 Background duplication is now file placement aware and will try to respect the rules when possible. 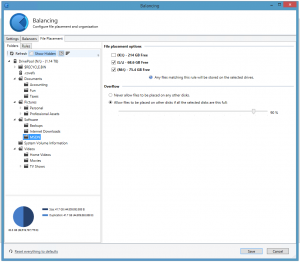 For example, when enabling duplication on a folder, if that folder has a file placement rule then the second copy of the file will be stored on one of the disks that match the rule (if possible). The same thing goes for disabling duplication. If a file part is violating a file placement rule, it will be cleaned up first. It is now possible to disable a parent folder based rule for a particular subfolder by having all the disks checked on that subfolder. When renaming a file on the pool violates a file placement rule, the service will be notified and a balancing pass will be scheduled. 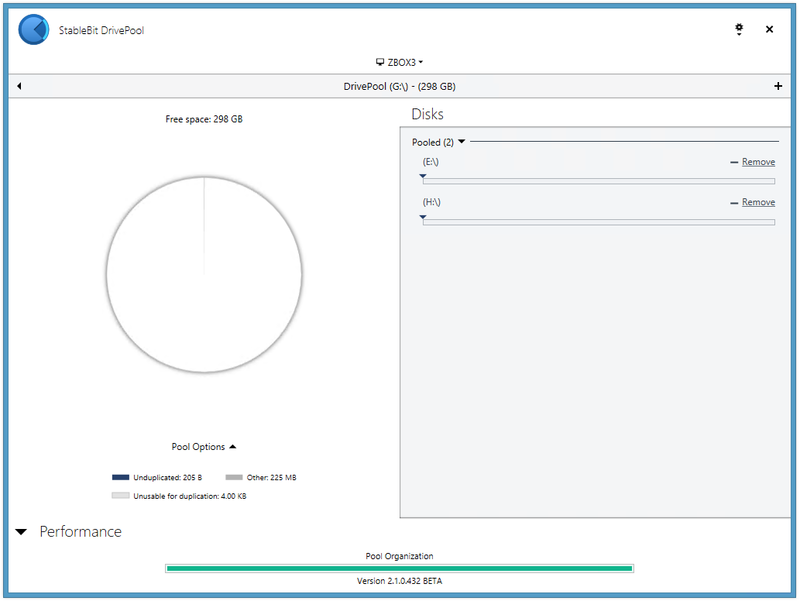 Multiple disk list issues were fixed that were causing the disks list in the main UI to flicker and the tooltips to sometimes disappear. This build is now being pushed to everyone who is using the BETA via automatic updates. Well, it’s been quite a while since my last post, but I have something substantial to share with you today. 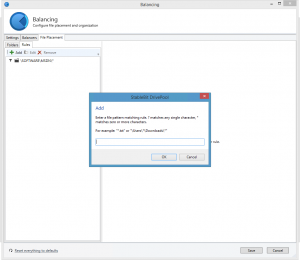 StableBit DrivePool 2.1.0.503 BETA now supports per folder (and per file) balanicng. 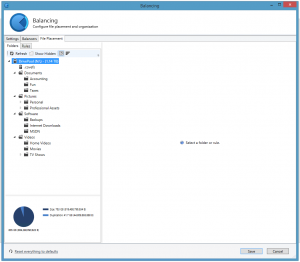 This is a major addition to the already extensive balancing options and it basically allows you to select which disks will be used to store the files in a particular folder (I believe that this is a first in the industry). Let’s take a look at how this new feature works. 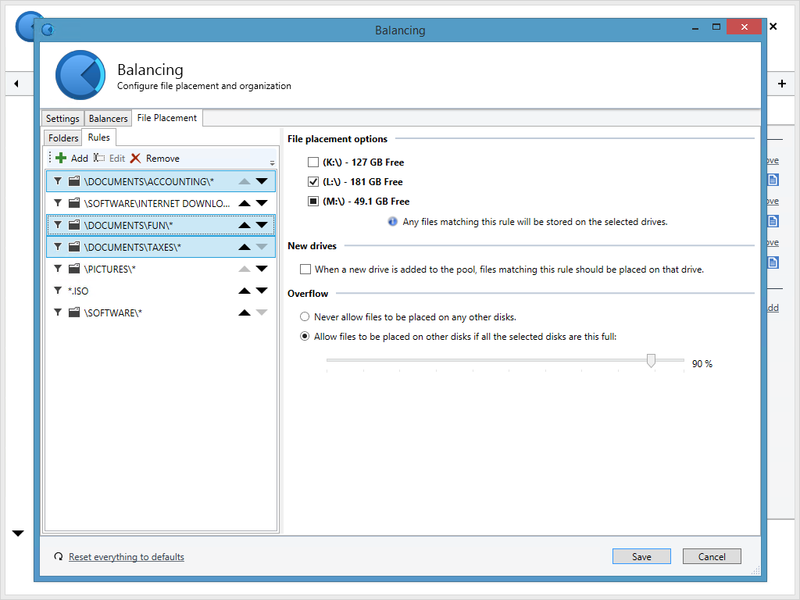 Even though this feature required extensive code changes to all 3 parts of StableBit DrivePool (the driver, service and UI), the UI to configure file placement sits under a single new tab in the Balancing window. I’ve set up a sample pool for this post, and on the left you can see the folder structure of it. 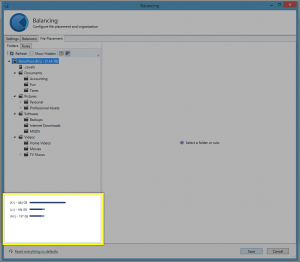 Selecting a folder will calculate duplication and file placement statistics of that folder. You can toggle between the duplication or file placement statistics view from the toolbar at the top. Each bar and pie slice has tooltips for more finer detail. 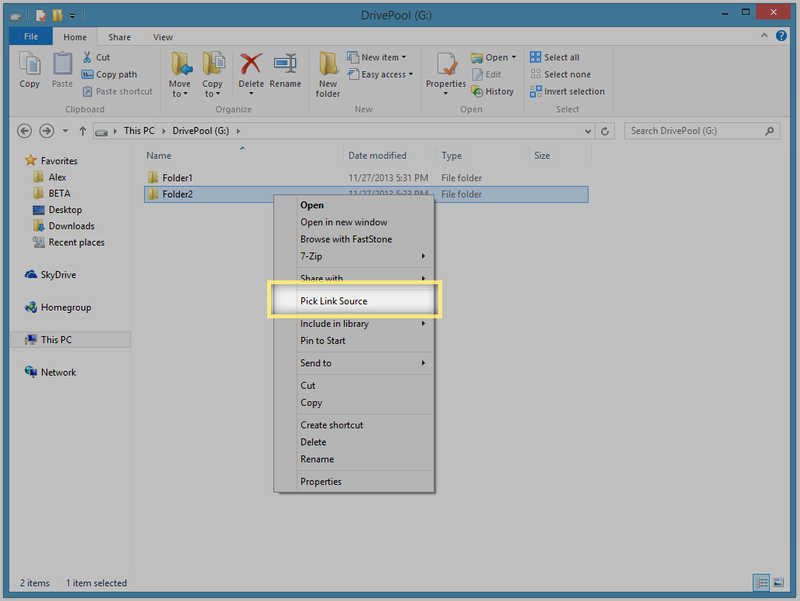 To define a folder placement rule, you simply select a folder and uncheck one or more disks on the right. Files in this folder and subfolders will only be stored on the checked disks. Here you can see that I’ve defined a new rule stating that I don’t want any files in \Software\MSDN, a duplicated folder, to be stored on K:\. 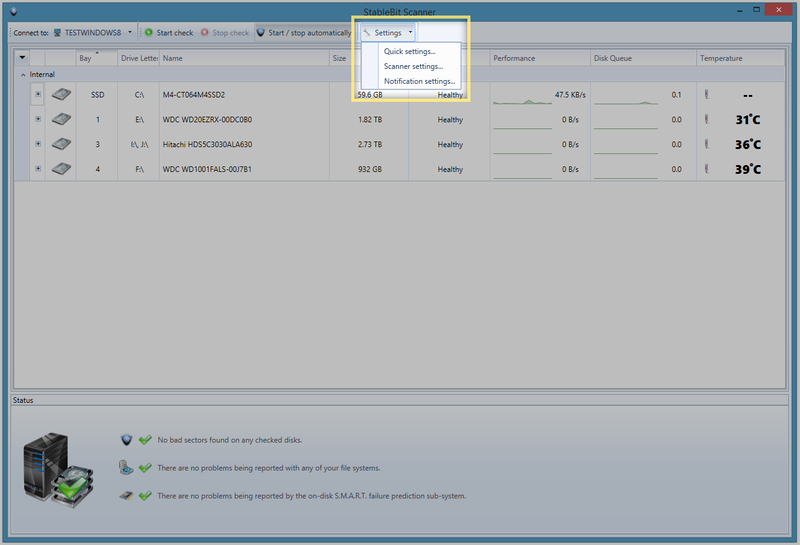 I also have the option to choose what happens when the other disks start running out of disk space. 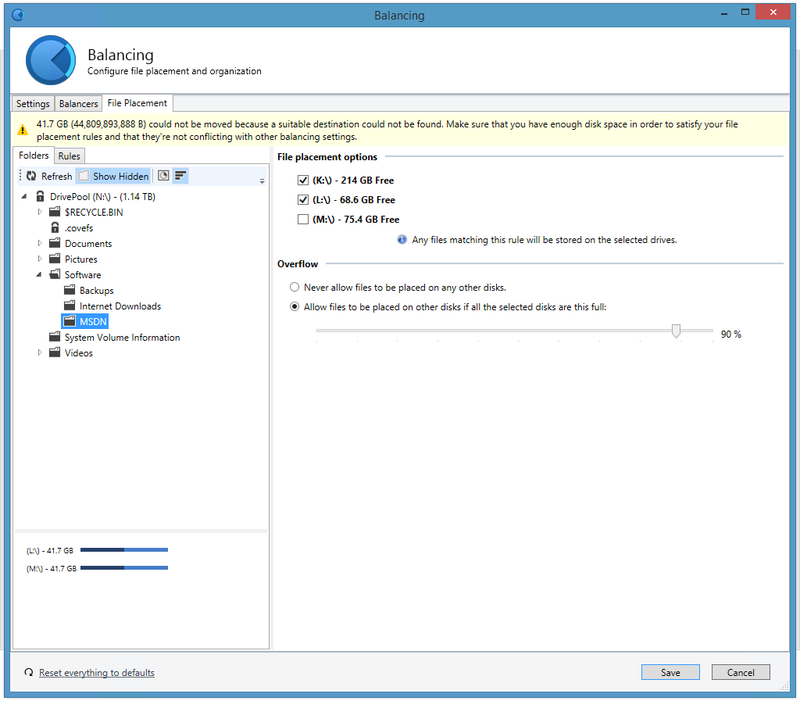 I’ve chosen to keep the default behavior and allow the files in \Software\MSDN to overflow to other disks if my chosen disks get used up to 90%. After hitting Save you can see that the Pool Organization bar drops down to 0% and you are offered the option to start a balancing pass immediately. 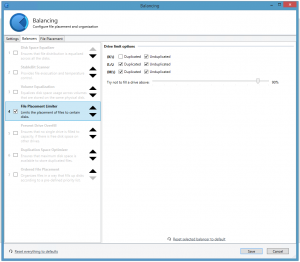 If you have automatic balancing enabled then a balancing pass will start as per your settings. If you’re in the horizontal UI mode (the window stretched wide) then you can also see a little file icon next to each disk space usage bar indicating that this disk had a file placement rule changed recently and that StableBit DrivePool needs to go through the files on that disk and reorganize them based on the new rules. 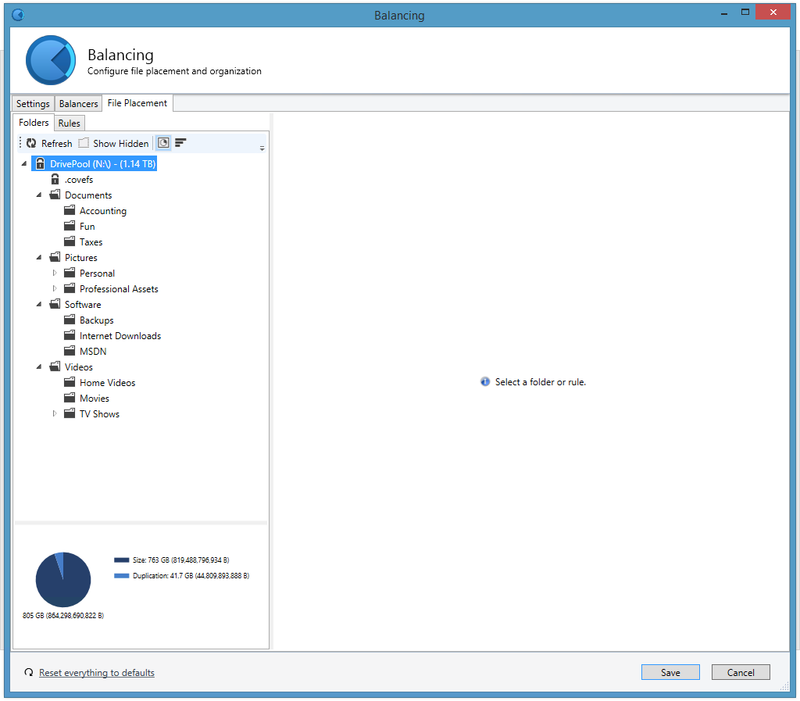 For the example above, just to make things simple, I’ve disabled all of my standard balancers. But let’s see what happens when I enable the Duplication Space Optimizer. You can see that the balancing markers have adjusted and that StableBit DrivePool now wants to move some unduplicated files from both M:\ and L:\ onto K:\. 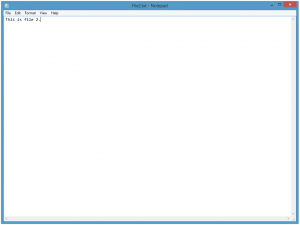 This is so that you would have more disk space available to your duplicated files on M:\ and L:\. Of course this would normally be taken care of for you automatically in a single balancing pass right after you define your file placement rules and you wouldn’t have to take any additional steps. In this case, I just wanted to show you this behavior. If you want to define more advanced rules on a per file basis, you can do that as well. Under the File Placement tab select the Rules tab and add a custom rule. You can type in any pattern that matches one or more files. A ? matches any one character. \Software\MSDN\*.ISO – Match all .ISO files under \Software\MSDN and its subfolders. \Users\*\Downloads\* – Match all downloads in any user’s folder. Don’t forget that you’re defining patterns to locate files and not folders, so you must at the very least include a trailing \*. As you may have guessed, the simpler Folders interface for defining rules actually uses the same rule definitions under the hood. 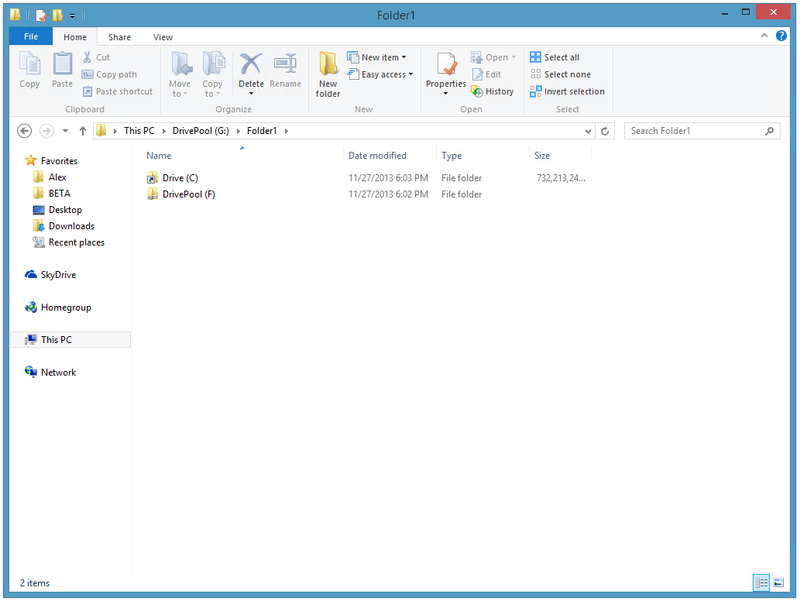 Those folder based rules can also be seen from the Rules tab. With all this power there is now the potential so set up conflicting balancing rules. Let me show you a simple conflict in order to demonstrate. I’m going to enable only the File Placement Limiter and I will tell it that I don’t want any duplicated files on K:\. I will then go ahead and change my existing file placement rule for \Software\MSDN to tell it to place files only on K:\ and L:\. You can see the problem here, \Software\MSDN is a duplicated folder, and I just told StableBit DrivePool to move the contents of that folder onto drives K:\ and L:\, but at the same time I’ve told the File Placement Limiter that I don’t want any duplicated files on K:\. You will see a new tooltip message over the pool organization bar telling you that some files could not be moved. If you open up File Placement once again, you will get a more descriptive message. 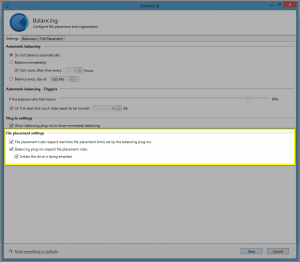 StableBit DrivePool now features a number of automatic conflict resolution settings and they can be found on the Settings tab of the Balancing window. I just want to wrap up this post by mentioning that there is now an affiliate program available for anyone to join. It’s completely free and basically it means that if you refer anyone to us and that reference results in a sale you will get 25% of that sale deposited to your account. Check it out, we could definitely use your help, and really do appreciate it. All you need is a PayPal account. StableBit DrivePool 2.1 has been in the works for a while now, and the list of fixes is also impressive (some of those were particularly difficult to pin down). This build features a whole lot of fixes and a major new feature, which is exactly how I like it. Next, StableBit DrivePool 2.1 goes final and “Product 3” is actively in the works which should integrate with StableBit DrivePool quite nicely. Let us know if you have any feedback on this build or about anything else @ stablebit.com/Contact. To those of you celebrating the holidays this week, happy Thanksgiving and happy Hanukkah! 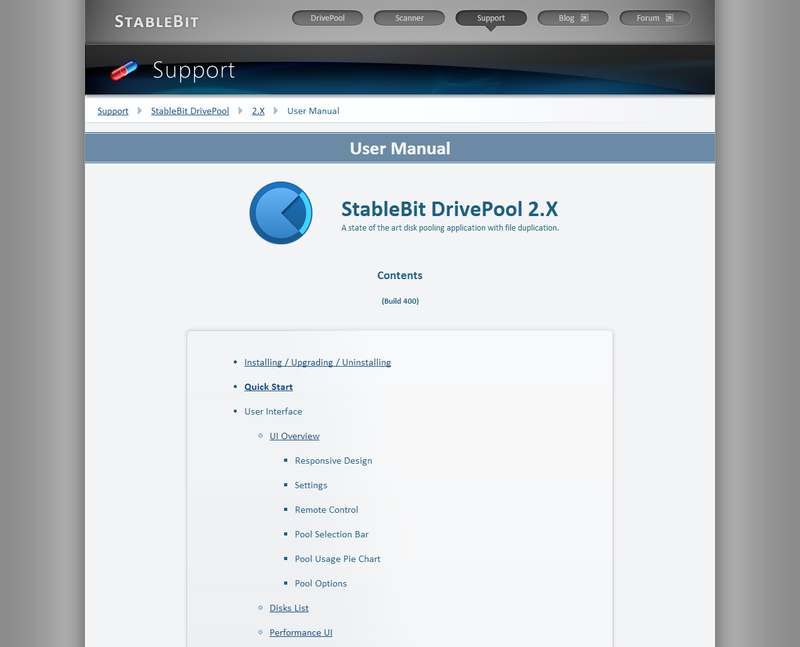 I have a brand new build of StableBit DrivePool to share with you today, it’s the next 2.1 BETA. This build took a while to get done (almost 2 months) and the main new feature here is support for reparse points. Reparse points are the underlying technology that Microsoft Windows uses to create links or shortcuts between files or directories, on the same drive or even among different drives. Unfortunately Windows Explorer is not very savvy when it comes to working with reparse points. I prefer to use a free shell extension called the Link Shell Extension in order to make working with reparse points easier. As an alternative, you can also use mklink and fsutil on the command line to work with reparse points. Reparse points can get very confusing if you try to think about how they work, so instead of doing that let’s dive right in with a simple example. For this example, I’ve created a new pool (G:\) and have created 2 folders in the root directory of that pool, Folder1 and Folder2. What we’re going to do now is create a symbolic link in G:\Folder1 that points to G:\Folder2. The first thing that we’re going to do is right click on G:\Folder2 and select Pick Link Source. 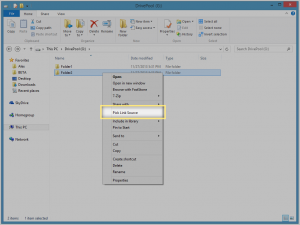 We then navigate to G:\Folder1 and right click, select Drop As… > Symbolic Link. You’ll notice that there are a lot of options here, so if you don’t know which one to pick, symbolic link is generally the best bet. What we now end up with is a symbolic link G:\Folder1\Folder2 that points to G:\Folder2. 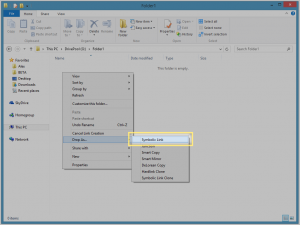 You can right click on G:\Folder1\Folder2 and select Properties > Link Properties to see some additional information about the symbolic link. From here we can see that G:\Folder1\Folder2 actually points to ..\Folder2. You’ll notice that the link target doesn’t contain a drive letter and so this is called a relative symbolic link. If the link target were G:\Folder2, then it would be an absolute symbolic link. 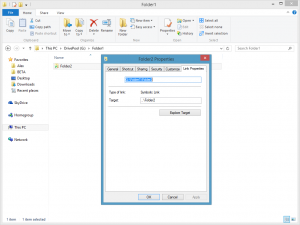 The Link Shell Extension will create the appropriate links for you automatically. So let’s navigate into G:\Folder1\Folder2. Notice that we see File2.txt which actually exists in G:\Folder2. Let’s open it up. And there we have it, the same text that we placed in G:\Folder2\File2.txt in the beginning of this example. It is important to understand that this is not a copy of File2.txt, but the original one and that G:\Folder1\Folder2 is not a copy of G:\Folder2. For example, if we place another file in G:\Folder2, it will automatically appear in G:\Folder1\Folder2, and this essentially illustrates what symbolic links (which are a type of reparse point) can do. In the example above I’ve shown how directory symbolic links work, but symbolic links can work with files, and there is no limit on how many symbolic links can point to the same file or directory, 1, 10 , 100, it doesn’t matter. In the screen above I’ve created 3 separate symbolic links in G:\Folder1 to the file G:\Folder2\File2.txt. All of these essentially are the same file. A symbolic link can technically point to any kernel path, which includes another disk volume. In the screen above, I’ve created a symbolic link in the G:\ pool that points to the F:\ pool. Isn’t that cool? Symbolic links are only one type of reparse points, and in my opinion they are the most flexible. 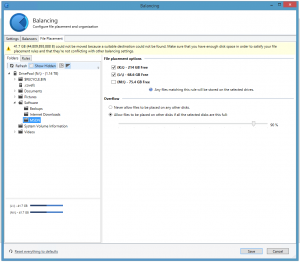 But in addition to symbolic links StableBit DrivePool supports junctions and mount points. In the screen above I’ve created a mount point to C:\ and a junction to F:\ in G:\Folder1. Junctions and mount points are precursors to symbolic links, which were not implemented until Windows Vista. I suggest using symbolic links unless you have a special need not to. In addition to the other types of links, the Link Shell Extension has the ability to create Hard Links. Hard Links are not implemented using reparse points and so this build of StableBit DrivePool does not support them. 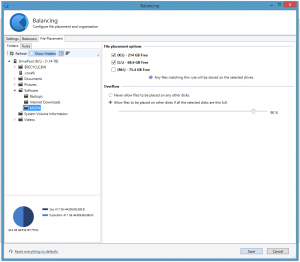 Hard Links are implemented directly in NTFS and can only point to a file on the same volume. The reparse functionality here was notoriously difficult to implement correctly and that’s why this build took so long to get out. 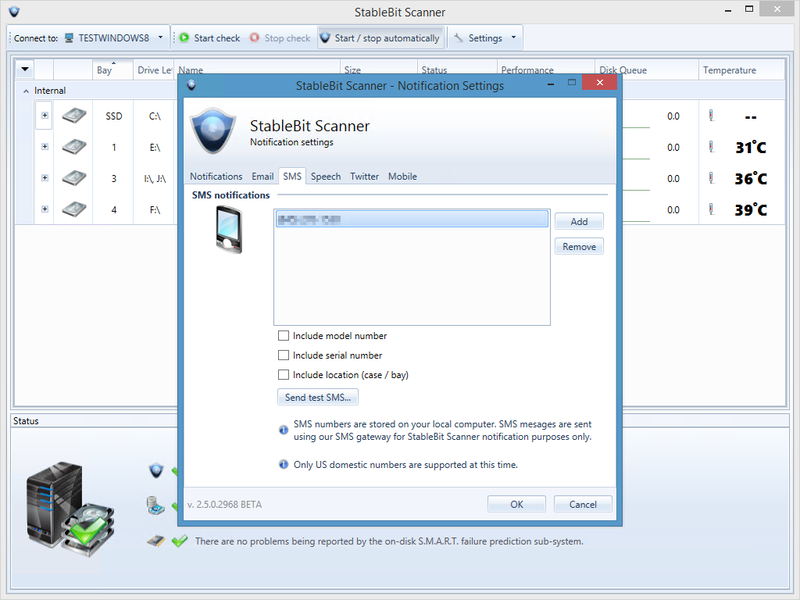 As a result, some functionality that I planned to include in it (such as TrueCrypt support) didn’t make it. But I just wanted to acknowledge that it’s on the way. This BETA of the StableBit Scanner features a complete overhaul of the notification system. The entire back-end was mostly rewritten and a new UI now allows you to configure our new, much more feature rich, notification system. You may be wondering why a rewrite of the notification system was necessary when the old one was working fine. The answer is that different notification providers send notifications in different ways. Because the old notification system was written essentially for tray icon notifications it only had the notion of an alert either being raised or not. The new notification system is much more flexible and supports a wide variety of notification scenarios. 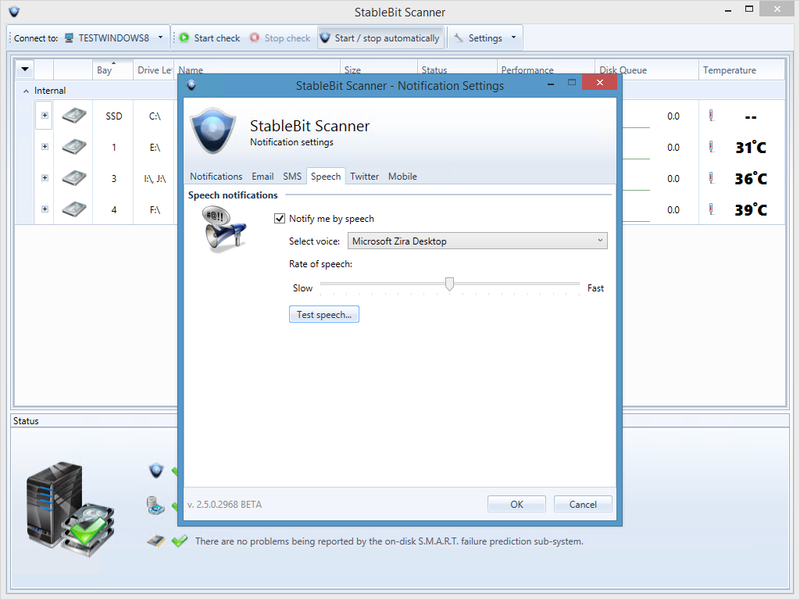 Because the new notification system is very comprehensive it deserves its own Window, so the old “Notifications” tab in Scanner Settings is now gone. The updated drop down menu is now called “Settings” and features the new Notification settings option. Let’s take a tour of the new notification settings window and talk about some of the new features. One of the first things that you will notice is that there is now a place to configure a “Site name”. Assigning a site name is basically a simple way of grouping all of your copies of the StableBit Scanner running at some site. When a notification is sent out, be it email, SMS or anything else, a site name will be included in the notification. There was a minor annoyance with the old notification system related to overheating warnings. If a disk’s temperature was hovering at the overheating threshold you would tend to get lots of notifications that the disk is overheating and then not, over and over again. This was kind of annoying so the new notification system has a “cooldown threshold”. Basically this means that an overheating disk does not exit its overheating state (as far as notifications are concerned) unless its temperature drops some degrees below the overheating threshold. Another thing that the old system didn’t have was a “test” button. In the new system, every notification provider now has a test button that sends a test notification using that provider. This lets you easily confirm whether you’ve configured the notification provider correctly and that your notifications will be delivered to you. Let’s now take a tour of all the notification providers. This is pretty much the same functionality as before, but with a nicer UI. You can enter multiple email addresses and test them by sending test email messages. 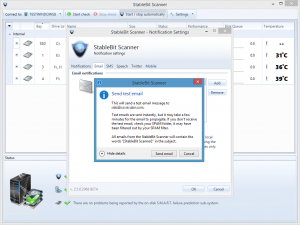 Emails are dispatched using our paid for Amazon SES service and we do not store the email addresses on our server only in your copy of the StableBit Scanner. This is brand new and really took a while to get right. There are a number of ways to send SMS messages out there. One way is to use a paid online SMS gateway that offers an API and then charges you per message sent. This can be expensive, but it’s the easiest to implement. Another way is to use a SMS Email gateway. Most cell phone providers offer SMS Email gateways which forward all emails received at your SMS Email address to your cell phone as a SMS. This approach is not reliable and requires the user to select their carrier. This is not what the StableBit Scanner uses, but if you’d like, you can certainly enter your SMS Email address in the Email notifications provider. 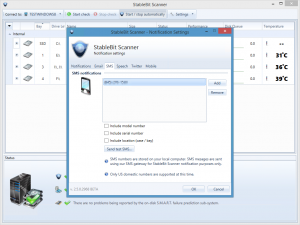 The StableBit Scanner uses a physical SMS gateway that sends your SMS directly to the cell network. We subscribe to a business SMS plan and a physical SMS gateway (in the form of a SMUSH Box). Your messages only stay in our system for the sending process and then all information about the message, including the telephone number is erased. For now this is enabled for US domestic telephone numbers only, but the plan is to add international support as well. Speech notifications have been updated to let you select the rate of speech and a different voice, when more than one is available (E.g. Windows 8). Yes, that’s right, twitter notifications are now possible. Why? Because twitter is the de facto social network for sending out notifications and status updates. It can be used as a point of integration with other cloud services (IFTTT comes to mind). You can tweet to all of your followers or direct message another twitter user (including yourself). While we don’t offer any mobile apps yet, but that doesn’t mean that we have to exclude smart phones and tablets from notifications. Whether you’re running iOS, Android, Windows Phone or even the Microsoft Surface the StableBit Scanner has you covered. 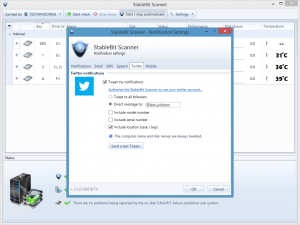 This is a very simple and clean service and it now works with the StableBit Scanner. Another great service to get notifications on the Microsoft platform. This one is a bit clunky but it seems to be popular. The free account is limited to 5 notifications a day, but you can upgrade to an unlimited account for a one time fee. One other cool thing that came out of the notification rewrite is the ability to completely customize your notifications. You see, every notification provider (except speech) uses XSLT to generate the notification text or HTML. 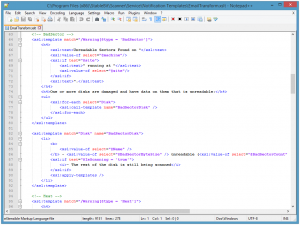 So if you know how XSLT works you can easily tweak your notification text for each provider. As you can see, you can change the text and structure of how the email is generated by editing this file. This BETA features a significant notification update, and more features are on the way. The next builds of the StableBit Scanner will concentrate on improving SMART reliability and accuracy by making greater use of cloud features. The next BETA of StableBit DrivePool is taking longer than expected due to some complications with reparse points. But a new build is in the works, so stay tuned for that. If you’d like the StableBit Scanner to support additional notification providers, let me know. I’d like to hear your suggestions. 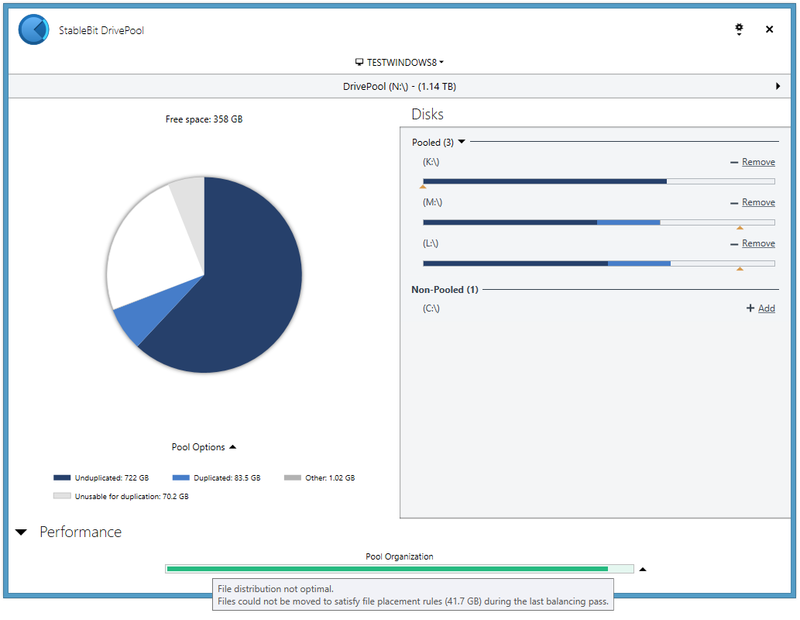 After going through a lengthy public BETA testing period, StableBit DrivePool 2.0 is now being tagged as a Release Final. Thank you everyone for testing the BETA and reporting any issues that you’ve encountered, most of those turned into direct fixes applied to the code. For those of you who may be visiting this page for the first time, and have never heard of StableBit DrivePool, let me give you a brief summary. 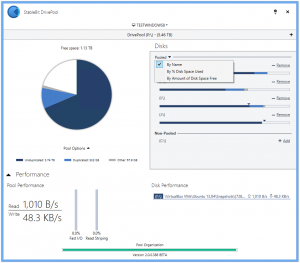 StableBit DrivePool 2.0 is a disk pooling application. 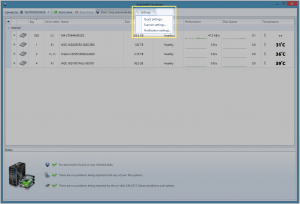 It can combine the free disk space of one or more hard drives without altering the existing files on those drives or anything about the disk formatting itself. 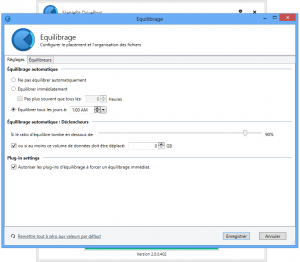 It creates a new pool, as a new virtual drive in the OS. You can freely add and remove disks to and from the pool at any time and treat the new virtual drive just like any other disk. 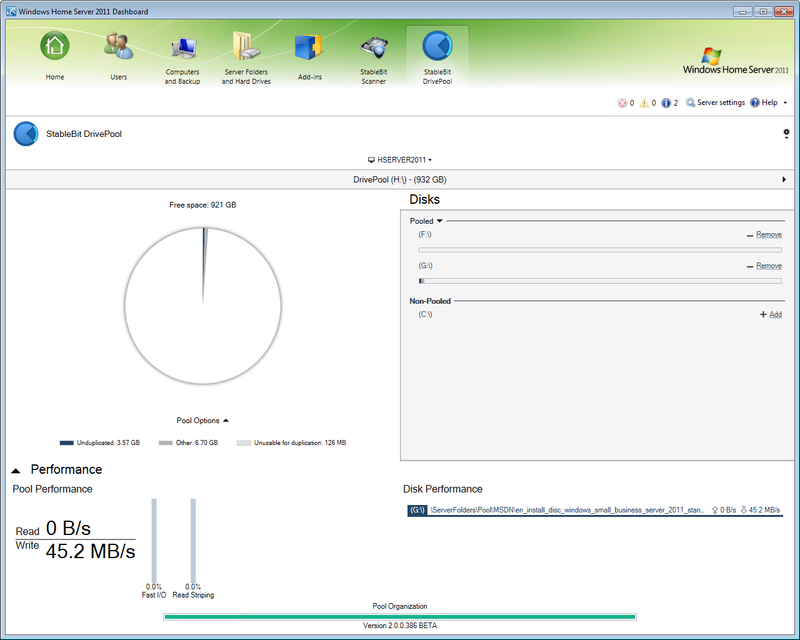 Your files are stored as standard Windows NTFS files on one or more disks that are part of the pool. 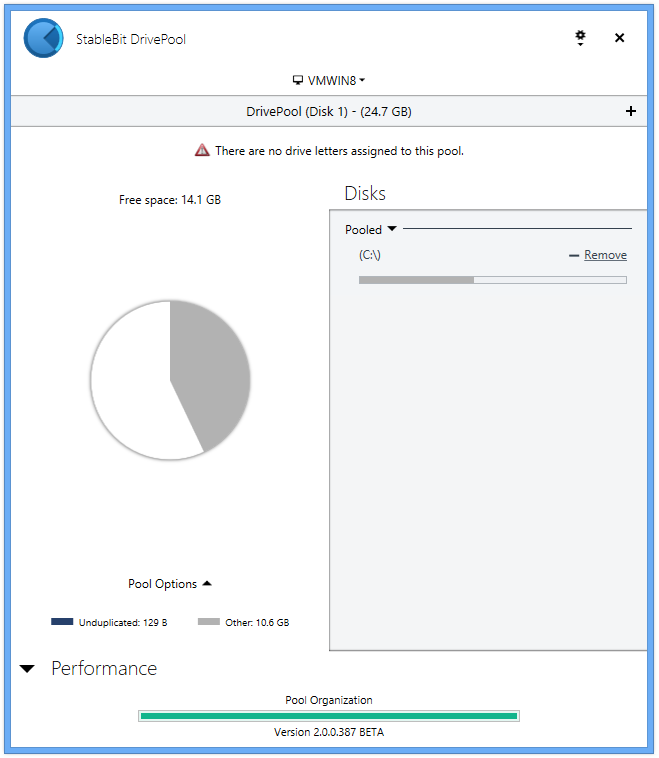 StableBit DrivePool also provides folder duplication. Basically you can designate the pool, or one or more folders on the pool as duplicated folders. 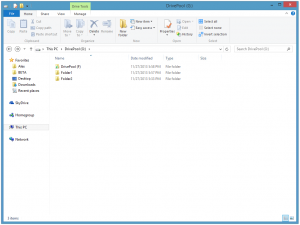 Any files placed in a duplicated folder will actually reside on two or more disks in the pool. StableBit DrivePool 2.0 OS support starts at Microsoft Windows Vista and newer. It supports both x86 and x64 variants of the OS. For those of you who are running the 1.X version and are happy with it, there’s no need to rush and upgrade to 2.0 immediately unless you want some of the new features. The 1.X line is still being worked on, just earlier today StableBit DrivePool 1.3.5.7572 was released. 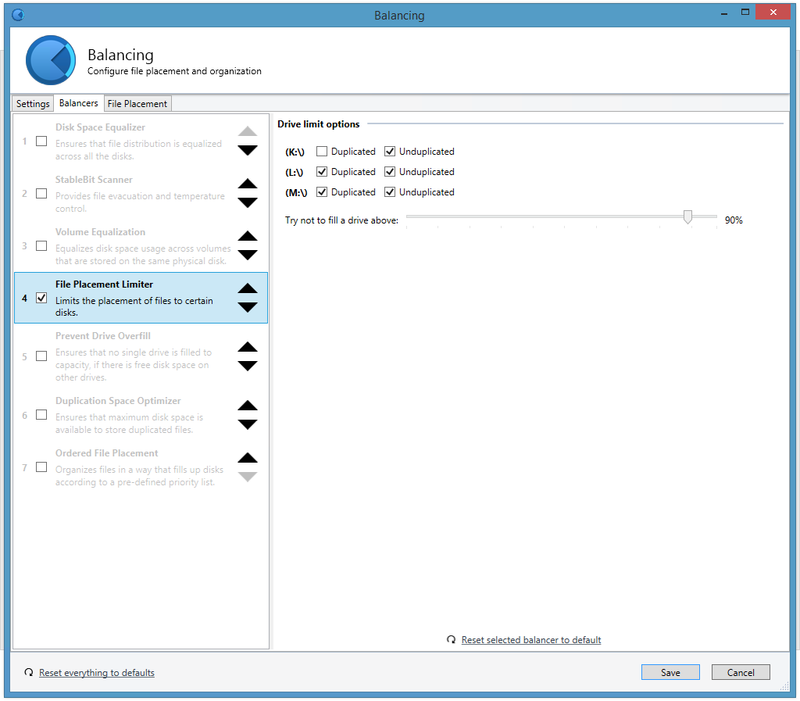 More flexible folder duplication settings. 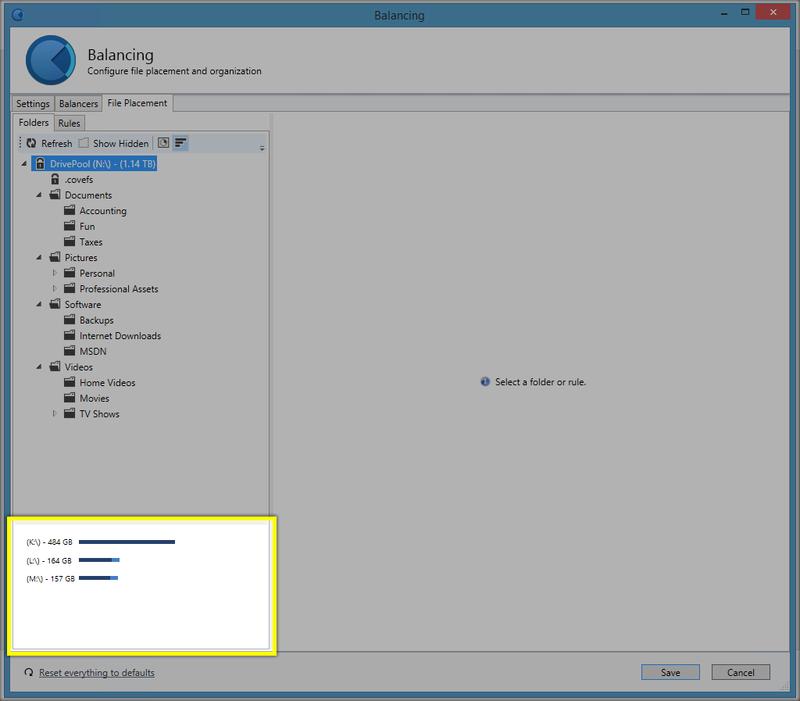 Setting duplication counts on sub-folders. A more “native” looking Dashboard UI. 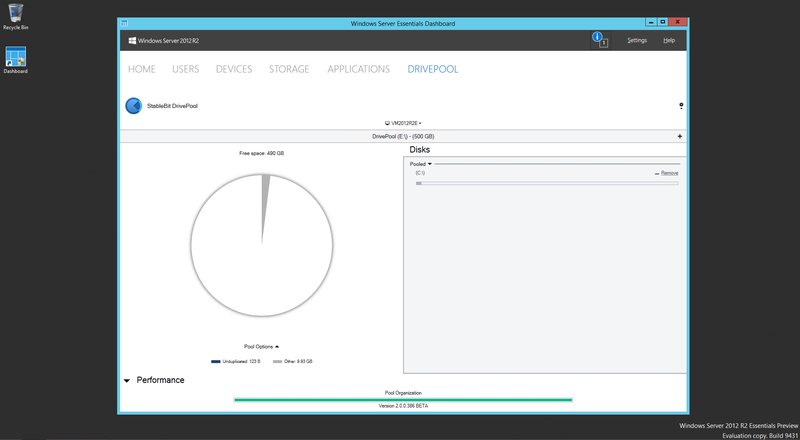 However, StableBit DrivePool 2.0 does install a Dashboard tab. Some of these will probably show up in 2.X down the line, but for now those are the differences. For me personally, I love the super efficient Remote Control. It means that I don’t have to load the Dashboard every time that I want to manage StableBit DrivePool or the StableBit Scanner. So I already upgraded my personal server. 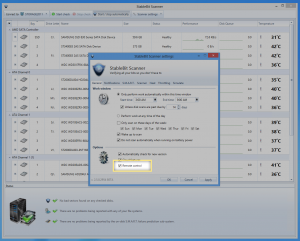 Uninstall StableBit DrivePool 1.X using the Dashboard’s add-ins tab. Install StableBit DrivePool 2.0 by logging into the server using remote desktop as Administrator. 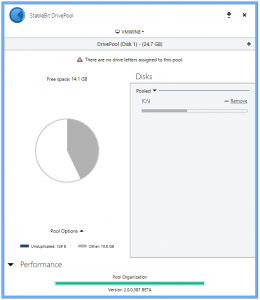 Uninstalling StableBit DrivePool does not alter your existing pooled data. 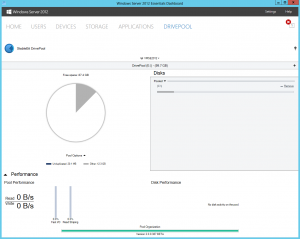 In addition, StableBit DrivePool 1.X and 2.0 use the same file storage scheme so they are backwards and forwards compatible. For more information, see the Manual. The initial StableBit DrivePool 2.0 BETA is now over, but that’s not the end of its development. A new StableBit DrivePool 2.1 BETA should be out within a couple of weeks, and of course we will continue to listen to your feedback and fix anything that’s broken. But there is something else in the works! A new product is under development right now which I am very excited about. No, it’s not related to BitFlock or anything remotely similar. While I can’t tell you any more than that for now, hopefully we can have a new public BETA of that in a few months. The latest BETA of the StableBit Scanner now supports remote control. 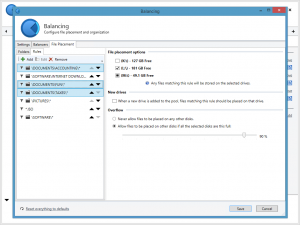 This feature functions exactly like it does in StableBit DrivePool 2.0. 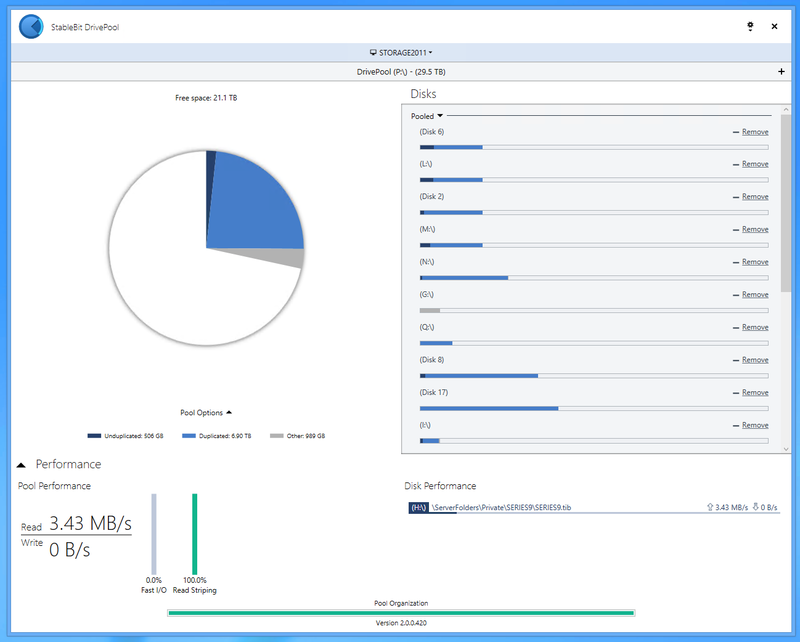 You can use it to manage your server from any computer on your local network, or you can centralize the management of one or more workstations from one location. It’s up to you how you want to use it. There’s really not much more to say here because it is a direct port of StableBit DrivePool’s functionality, including its support for “static peers”. 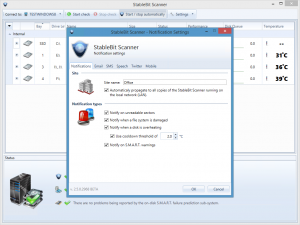 If you don’t want remote control enabled then you can simply turn it off in the StableBit Scanner settings window. For the upcoming StableBit DrivePool 2.X release final, the localization was done by paid professional translators, but I’m sure that it’s not perfect. Software translation is very difficult to get right because of all of the technical jargon involved and the lack of context for the translator. But I’m sure that you, our users, know exactly how to translate something that’s on the screen into your own native language. Well, now there’s a way for everyone to contribute to our translations. Using the OneSky service (http://www.oneskyapp.com), all of the translations for StableBit DrivePool 1.X and 2.X are now open to the public. You can review existing translations, offer alternatives, and vote on which translations are the best. Your changes will be included in future builds of StableBit DrivePool. StableBit DrivePool 2.0 is now a Release Candidate! 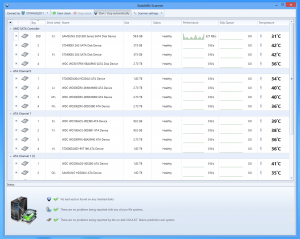 This build will be pushed via. automatic updates to everyone using the BETA within 24 hours. What Exactly is a RC? As far as StableBit products are concerned a Release Candidate is built exactly like a Release Final. The idea behind having a RC is to test the Release Final build process. It’s simply a Release Final that has been renamed to a RC. A RC can be promoted to a Release Final with no rebuild. This means that the trial BETA rules no longer apply to RC builds. Your days remaining on the trial will not reset when installing subsequent RC / Release Final builds. This build has a number of miscellaneous fixes and tweaks since the last BETA. Localizations are mostly complete for the following languages: Spanish, French, German, Polish, and Italian. If you like reading manuals then you should definitely check it out, it took a lot of work to put together. The PayPal payment system was updated to use PayPal’s latest API in order to get rid of the old and somewhat clunky “PayPal for digital goods” API. Google Checkout (or Wallet) is being retired by Google in November (see: https://support.google.com/checkout/sell/answer/3080449?hl=en), so we’ll be phasing that out soon. It will probably be replaced with Amazon payments at some point in the future. This has been requested quite often. 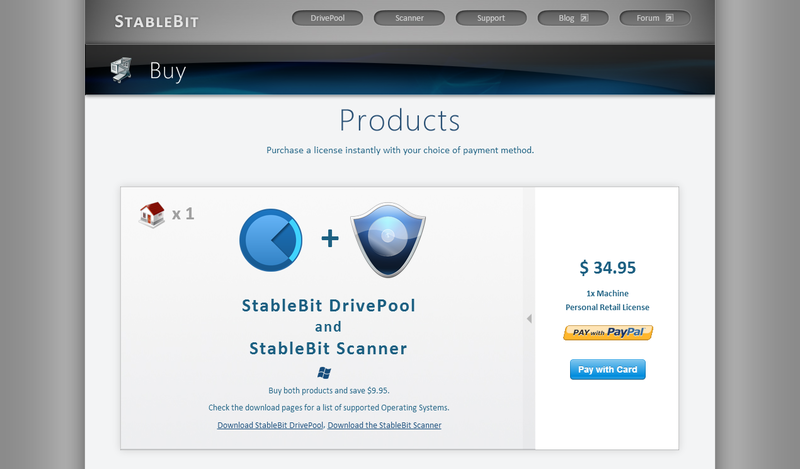 If you’ve never purchased either the StableBit Scanner or StableBit DrivePool you can now easily buy both with the $9.95 discount without buying each product individually. There are also links on your order page that make it easy to buy additional copies of a product with the additional unit discount. The first BETA of StableBit DrivePool 2.0 came out on Feb. 1 2013, and here we are in the beginning of September 2013 with a RC. All in all, I think we’ve made pretty good time considering the scope of this release. Windows Server 2008 (64 bit), Windows Server 2008 R2 (64 bit), Windows Server 2012, Windows Server 2012 R2. Windows Home Server 2011, Windows Small Business Server 2011 Essentials, Windows Storage Server 2008 R2 Essentials. I’ve highlighted what StableBit DrivePool 1.X supports. As you can see, that’s a lot of new Operating Systems that we now support. Plus, we have the brand new remote control system that lets you manage your pools from other computers on your LAN (without the need for a Dashboard). StableBit DrivePool 1.0 Release Final came out on April 2 2012, almost 1 and a half years ago. It was a great release and it was priced at a very affordable $19.95. Since then we’ve added a ton of new features, including the balancing framework, multiple pool support and everything that you see in StableBit DrivePool 2.0. All of these new features come at no additional cost to our existing customers, and we’re not done yet. We’ve added a lot of value to StableBit DrivePool since that first release, and I feel like we need to bump up the price a bit to reflect that. But don’t worry, nothing has changed yet. The price won’t be increased until a release final is published. The future price increase does not affect our existing OEM partners. You will continue to be able to purchase client licenses at the negotiated rate. Thank you Christopher for offering outstanding technical support to our customers. And thank you everyone for your great support of our products, but the best may be yet to come. Post 2.0 we may yet see some really amazing game changing features in StableBit DrivePool, if everything goes according to plan. As always, if you like our products I ask that you spread the word. 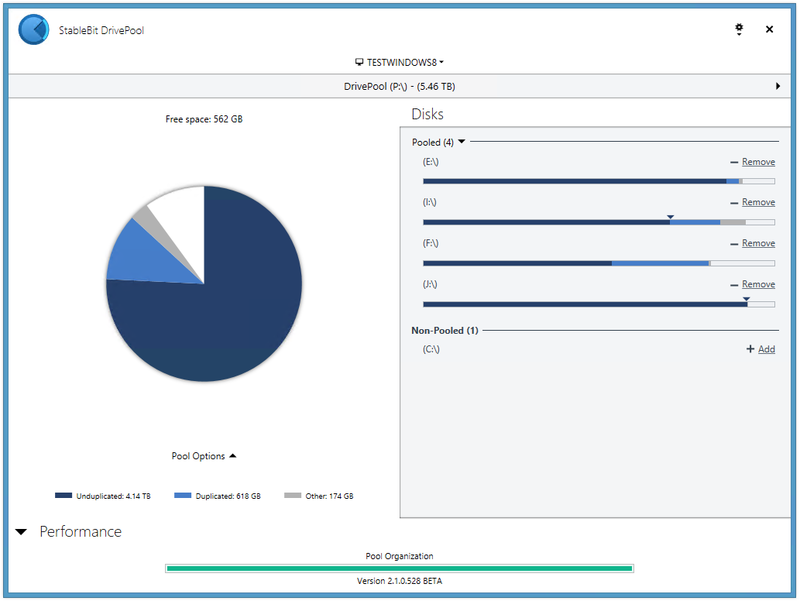 I think that StableBit DrivePool 2.0 turned out really well and I’m sure that there are many people out there who have never heard of it and may benefit from using it. Well, I guess you can say that we’ve come full circle. 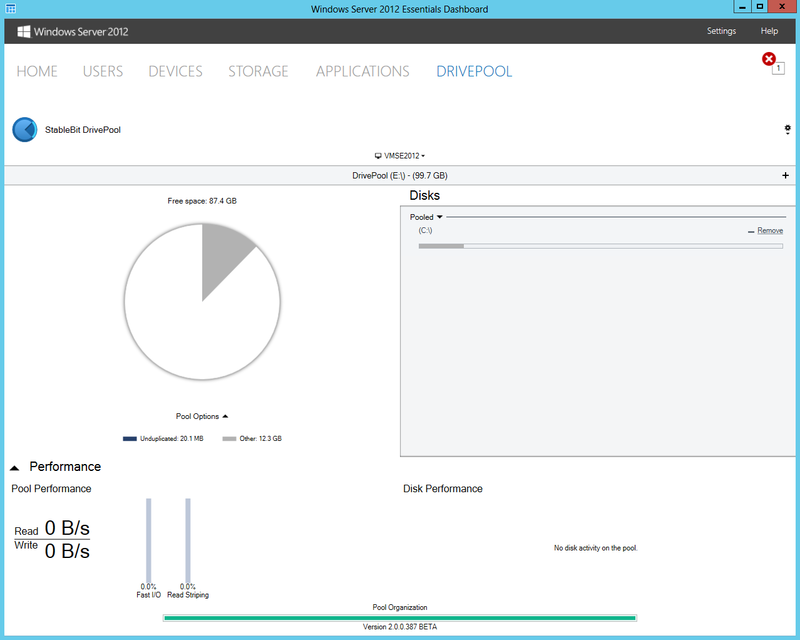 The latest build of StableBit DrivePool 2.0 features a WHS 2011 Dashboard tab. 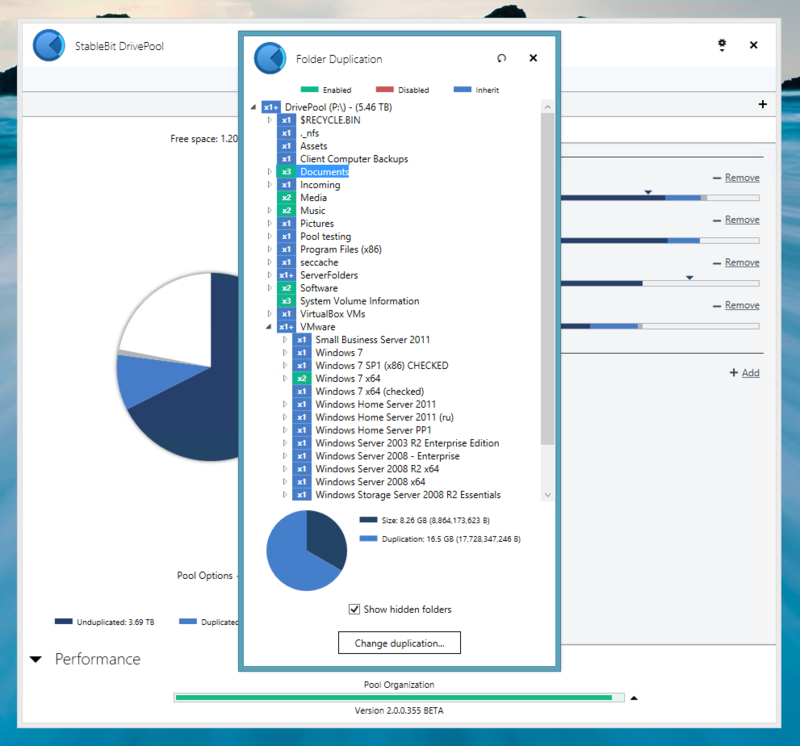 Not only that, it adds a Dashboard tab to any OS that has a Dashboard starting with WHS 2011, including the Windows Server 2012 R2 Essentials Preview. To get the Dashboard tab you can simply install the latest build on any OS that has a Dashboard and the installer will recognize it and install the necessary Dashboard components. There is no separate WSSX installer for now, perhaps we can add this in the future. This build is mostly about miscellaneous fixes as we approach the release final, but there is another small noteworthy feature. You can now sort your pooled disks in various ways from the horizontal UI. This was actually a user request turned into a feature and was a pretty simple thing to implement, so there you go. Of course the answer is simple. The files are actually not altered and are still on the original disk. 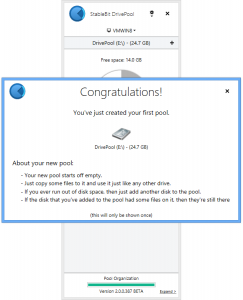 By adding a disk to the pool, the files on that disk are really not altered in any way (I mean really), but the disk now contributes its free space to the pool. To alleviate the confusion, there is now a help screen that pops up after you create your first pool. Don’t worry this only shows up once to help new users understand how the pool works. 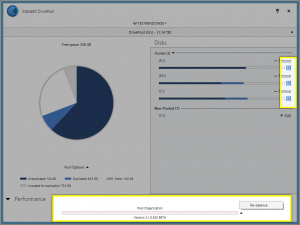 Microsoft NFS Server support was fixed for Windows Server 2012. The ability to add a pool part from the command line. Pools without a drive letter assigned would not be recognized correctly. This was actually a big problem if your “automount” setting was disabled in Windows. UI settings were getting reset on each update. 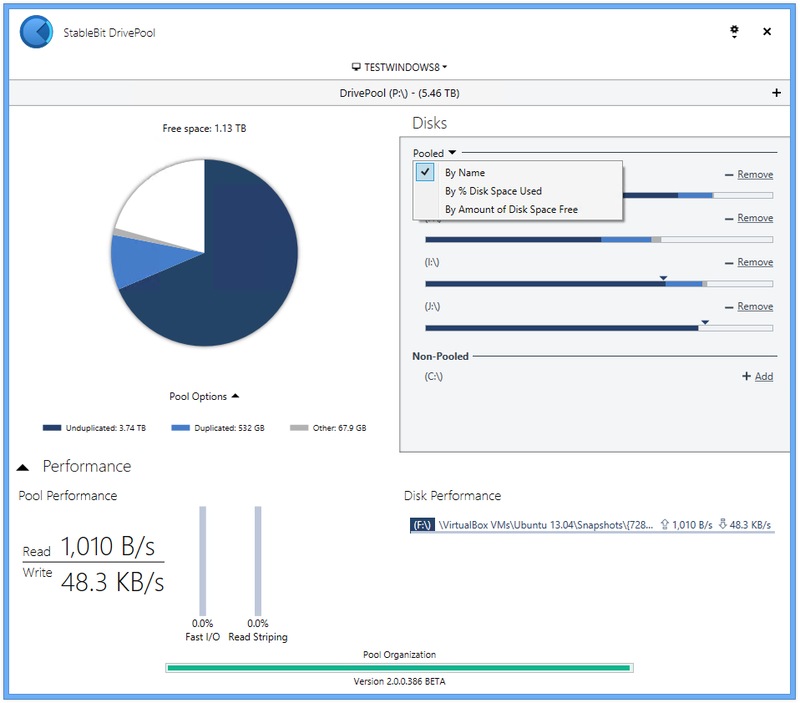 Some flash card readers were causing the Service to constantly update the disks list, leading to unnecessary CPU load and a slowdown of the UI. 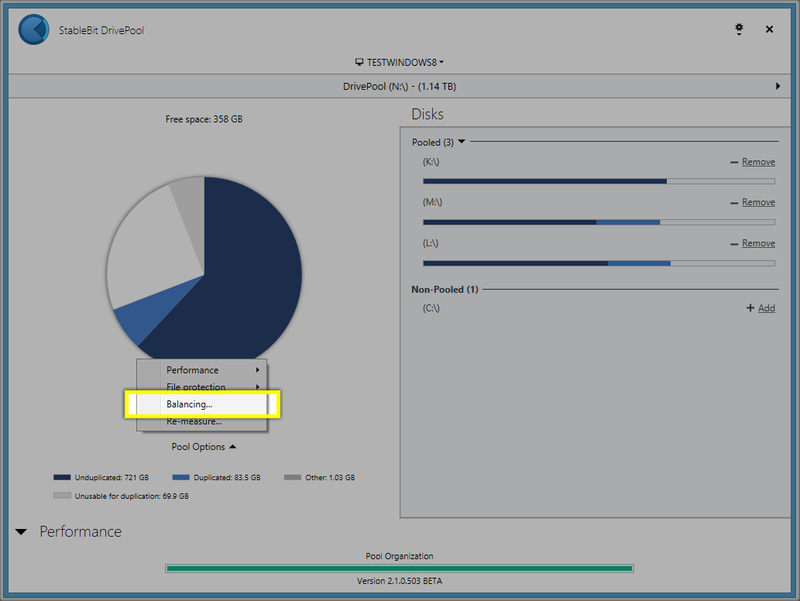 All UI state is now stored in “%appdata%\StableBit DrivePool” allowing for an easy reset. 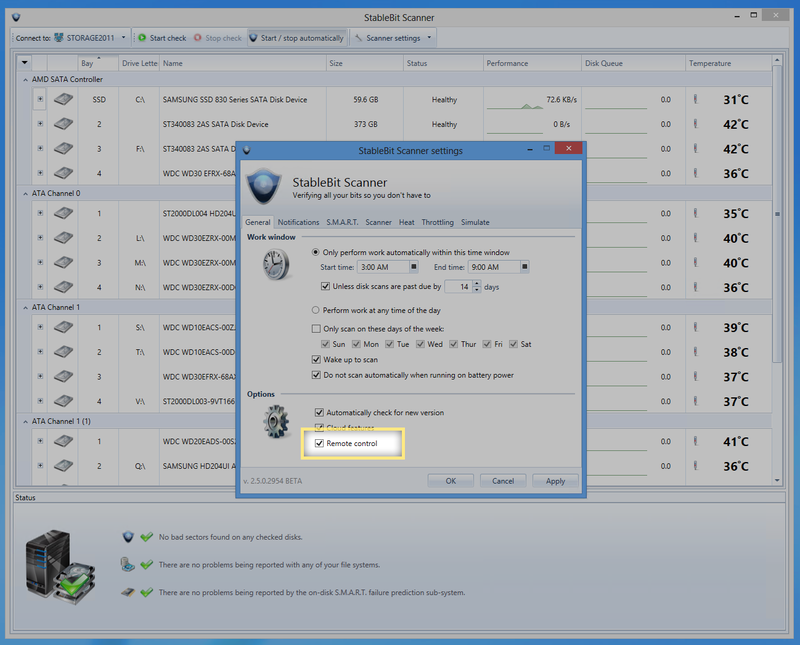 At this point everything needs to be tested thoroughly and hopefully we can see a RC of StableBit DrivePool 2.0 soon.